I'm no USATF insider, but it seems to me the organization is at a crossroads. Among USATF's biggest responsibilities is to field a highly competitive Olympic team. But the scope of the USATF goes way beyond world-class athletes and bringing home gold medals. The USATF is a member organization and, the more members it has, the stronger and more relevant it will be. I'm a member of the USATF, and what do I get for it? Not much. USATF puts out a really crappy magazine that barely interests me because it says not a word about ultrarunning. The problem with the USATF is that it's failed miserably to engage its members--people like you and me. Consequently, the organization is stagnant. Others feel this way, too. And, the USATF really couldn't care less about one area of the sport that is growing like a weed--ultrarunning and trail running. Yes, road racing has exploded in recent years, but so has trail running and, in particular, ultrarunning. Because of a best-selling book, more than 800 entered this year's Leadville Tail 100. Your chance of getting into the Western States 100 the first time around is about as good as a snowball's chance of surviving a second in hell. Nearly every ultramarathon has seen huge growth, and every year we're seeing scores of new races. Is the USATF paying attention to what's happening on America's trails? Despite ultrarunning's explosive growth, the USATF gives lip service to the sport, not celebrating its biggest stars, not telling stories of those who toe the line, and really doing very little to promote ultrarunning. Furthermore, the USATF applies a set of one-size-fits-all rules to ultrarunning championship events that are quite nonsensical. If that's not enough, the USATF ultrarunning championship races fail to attract all or even a majority of the sport's top talent. I'm all for the USATF having championship ultrarunning events, but these events must attract the sport's top athletes (bigger purses, travel accommodations, etc.?) and they must have rules that lure ultrarunners of all abilities. Did you know that in USATF ultrarunning championship races, runners who participate in the championship cannot have pacers, nor can they wear headphones? Also, in a USATF championship race, you have to be a member of the USATF in order to participate in the championship, and thus you have to follow all USATF rules (including no pacers) or you will be DQ'd. If you aren't a member of the USATF, you can still run in the event, but you are not eligible for the championship, and you can have pacers and wear your iPod unlike the USATF runners. Gee, I wonder which set of rules is going to be more attractive to newcomers to the sport? So in a USATF championship event, you have two sets of runners--USATF members and non-members--each with different rules. I have no issue with pacers being banned at USATF 24-hour championship races since these races are usually on well-lit loop courses and held in a very controlled environment, but I do have a problem with pacers not being allowed at USATF 100-mile trail championships. Pacers in 100s provide safety, first and foremost. In the dark hours of night, it's a good thing for a wary 100-mile runner to have an extra set of eyes to help him or her stay upright and avoid danger. These vital functions of a pacer can be done without providing unfair aid to the runner. The USATF doesn't see it that way. It also thinks headphones provide an unfair advantage and are dangerous. Whatever. For the newcomer to the sport of ultrarunning who has decided to take on a 100, why would they ever participate in a USATF championship when they can't have a pacer? Yet that same runner can have a pacer if they run the race as a non-USATF member. How is the USATF ever going to grow when its rules place it a great disadvantage in attracting new members? I hope with its new CEO--whoever that might be--the USATF rethinks its approach to attracting new members, places an emphasis on promoting ultrarunning and applies a set of rules to ultrarunning championship events that make sense, further the sport and at the same time bring new blood to our governing organization. As the USATF CEO search committee interviews candidates, two words should reign superior. RELEVANCE. GROWTH. Getting my legs back / How about some inspiration? I'm finally starting to feel some strength and speed in my legs. It took three weeks for the turnover to get better and for my legs to actually feel alive again. Strangely, I think my two bike rides last weekend did me some good--physically and mentally. When I got out on Monday morning for an 8-miler my legs were turning over nicely and I felt better than I have in probably a few months. Happily, I've also discovered a new dirt-road loop not far from where we live. It's hilly and challenging and, best of all, the dirt surface is great for my legs and has been very therapeutic. My knee is feeling close to 100%. When we move into our new house in November, I'll need to find a new dirt road to run on a daily basis. Unfortunately, the plantar fasciitis in my left foot still isn't totally gone. It's much better, but it's lingering. I think this week I'm going to see my doctor. I should have gone to the doctor two months ago. Last week (9/6-9/12) I ran 53 miles and biked 30 and this week (9/13-9/19) my mileage hit 61 and I also biked 20 miles on Sunday. The time on my bike has been so enjoyable and I only wish I could go for a ride every day, including commuting to and from work a few times a week (not possible since I pick up Noah at the end of the day). The guys I see almost every morning cruising down the Suphur Gulch Trail--their bikes loaded with their work gear--have figured out something that hasn't dawned on enough people. They don't have to worry about traffic, emptying their wallets at the pump or making enough time everyday for exercise. They have it all figured out, and one day I'll join them. I'm starting to develop a desire for a fast, light-weight road bike since we have such awesome paved paths on the Front Range. My time on the bike has demonstrated to me the importance of cross-training. I love getting out of the saddle and powering away up climbs. Assuming I continue to feel this good and my foot is up to it, I am planning to run in the Rock 'n Roll Denver Marathon on Oct. 17. This will not be a key event for me, meaning I won't be out there guns blazing looking for a sub-3:00 time. I just want to do a marathon and qualify for Boston should I venture to Beantown next April to toe the line. I don't have long to decide--Boston sold out in November last year! The video below really tugs at my heartstrings and I highly recommend you take five minutes to watch it all the way through. It's about a guy who fought depression because of his weight and ultimately lost 120 lbs. through running. A little over a minute into the video you see him running around a track. Very inspiring. This video illustrates the transformative power of running. It changes you physically and mentally. Throughout my 20s I was pretty doughy (you can see a photo of the fat Wyatt here--I'm standing and to the far left), despite the fact that I did run a little here and there. It wasn't until we adopted a new diet and I decided to finally take on the marathon that everything changed for me. I've never looked back and not a day goes by that I don't feel grateful for what I can do in my running shoes. Aside from my wife, our son, my faith and my family, running is best thing that's ever happened to me. We all have a story to tell, and I think this guy's story is amazing. Left heel (plantar fasciitis): Getting better but slowly. Strayed from my daily strengthening and stretching exercises and have recently re-committed myself. This excellent video is where I got my exercises. Left knee: I think the problem in my left knee is a classic case of runner's knee. 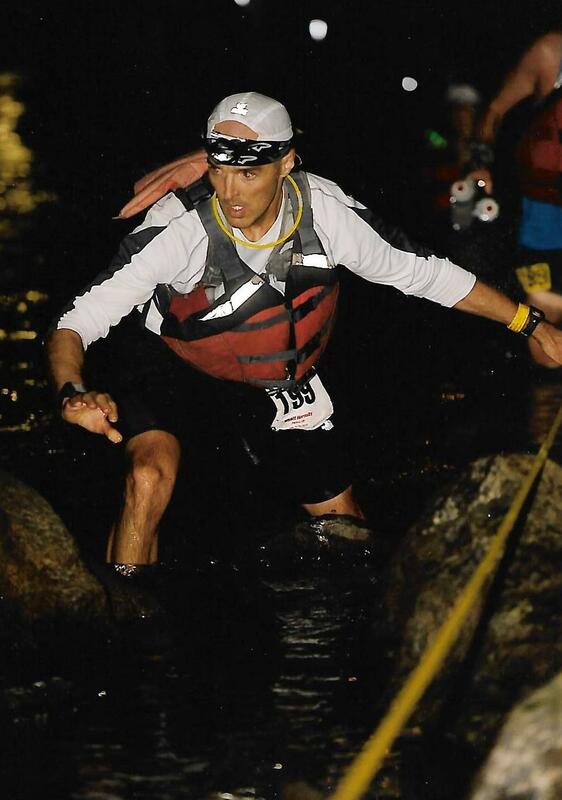 I first came down with runner's knee during the 2008 Mohican 100 (literally around mile 60) and it took me a few weeks after the race to finally get over it. I can run, but my knee does protest a little. Shoulder/neck: I woke up on Friday morning with a wicked cricked neck. Though not an over-use injury, it's just icing on the cake. My Friday morning run really sucked. Every time I swung my left arm I was in pure agony. I should have stayed home. Incredibly, all three of those injuries are on the left side of my body! I was quite banged up after the 24-hour national championship last October and it took my about a month before I was able to start getting back in a groove. I know that, with patience, I'll be back a groove soon enough. 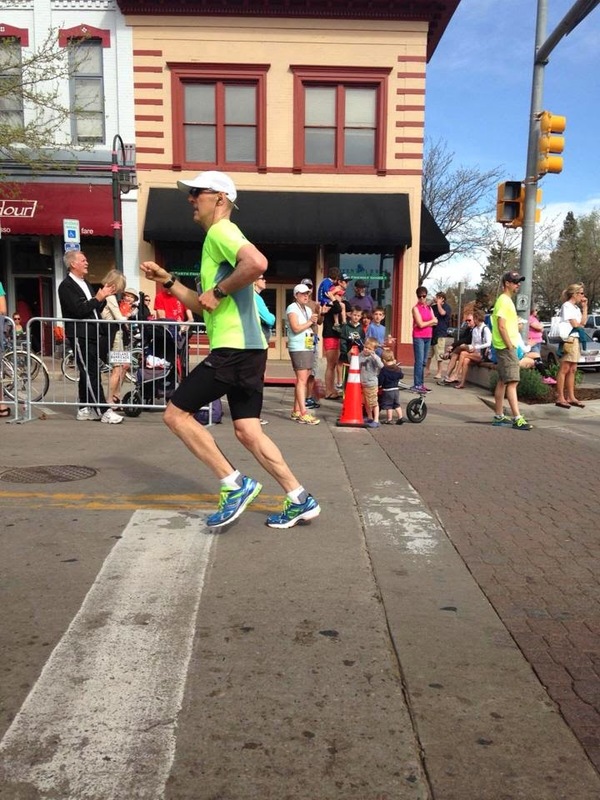 At this point, I'm not physically able to run the Rock 'n Roll Denver Marathon, but it's still possible. I'd love to get to 4,000 miles this year and it is quite possible but only if I average about 73 miles per week for the rest of the year. I came within 50 miles of 4,000 in 2008 and 2009 and would love to finally do it. But--the question has to be asked--why is 4,000 so important? Slumps are not fun. I do not fully know what happens as we go into a slump. Mostly I think a slump starts with physical fatigue (muscles, bone, etc). Once we have put ourselves into a position where we are forced to recover, and don't.... then we put ourselves into hormonal fatigue (cortisol, testosterone, stress hormones). During hormonal (endocrine system) fatigue, we are unable to produce the hormones that we need to recover well, rebuild, sleep properly, etc. With all of this, we enter into a point of no routine. Once our hormone levels are out of whack and we are not sleeping well, eating well, or training well; now we are in a place where we feel 'flat' and 'out-of-shape'. This out-of-shape feeling is perpetuated by the simple fact that our testosterone and natural HGH production are decremented. We less of these two hormones, we feel 'soft' and 'fat'. Once we feel like this... we are convinced we are just falling out of shape and need to train more... and thus the cycle continues. With all of this, I typically fall into a place of mental disengagement at this point. With mental disengagement and continued training we deplete our hormonal reserves further; and suddenly we are emotionally drained, listless, and uncaring. At least this is how it goes for me. That pretty much sums up where I've been since Leadville. I feel in many ways like a ship lost at sea. I'm floating in a vast ocean without any idea of where I'm supposed to be going and without clear directions as to how to get there. I look around me and I see so many runners who have something I don't. I think I have enough ability--and certainly the desire and drive--to be something in this sport and accomplish my goals, but yet I'm missing something in my training, or maybe it's in my mind, that is holding me back. I have to find that something. I'm so happy to be here in Colorado, where I've ALWAYS wanted to live. Not a day goes by that I'm not excited about life in Colorado, in awe of something I see (for example, on Saturday morning I literally saw purple mountains on my way home from my run), and energized by the endless possibilities of outdoor adventure, but it's much harder here. I have to figure out what I'm doing wrong, or not doing at all or enough, so that I can get better. Maybe all that's needed are time, patience and continued training. This past weekend I also spent some quality time on my bike. It's nothing fancy; just a Marin hybrid bike that I bought a few years ago. I really enjoyed spending time on my bike. On Saturday I headed into the Parker hills for 20 miles and then on Sunday did 12 miles around our future neighborhood, which has some really great bike paths throughout and beyond the development. Saturday's ride saw a few max speeds of over 30 miles per hour. At one point I hit 34 mph, at least according to my Garmin. It was a nice change of pace. I'm thinking seriously about what I'll need to do to have a better 2011 racing season. I've kicked around the idea of reducing my peak weekly mileage but have decided against that. Instead, I'm going to be much more strategic in my training and try to cycle my efforts so that I'm peaking at race time. 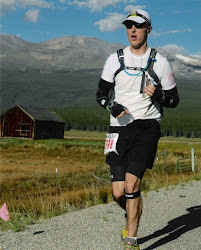 For instance, this year July was my heaviest month as I trained for the Leadville 100 on Aug. 21--even as I did two mountain races (Leadville Marathon and Barr Trail Mountain Race). What if my heaviest months were April, May and June and then I scaled back just a bit in July (by 10-15%)--when the Leadville Marathon and Barr Trail Mountain Race roll around--so that I have quality outings at each? What if I also cross-train (swim, bike, weights, etc.) and focus even more on my core? A good plan? We'll see. Over the weekend I watched "No Impact Man." This is a documentary about a man--Colin Beaven--and his family who give up everything that creates an environmental impact--from toilet paper and diapers for their toddler to electricity and meat. In the beginning of the film, Colin expressed his concern about deforestation--a concern many of us have. This film struck a nerve with many people, and I think it's because we all feel guilt over our carbon footprint. I think Colin Beaven's point was not that we should all give up modern comforts for cave life (in the end, the family turns their electricity back on); the point of "No Impact Man" is to demonstrate that there's something we call do to help improve the environment and safeguard our planet. I put the point of the video this way: Let's say you claim you could never finish a half-marathon and you cite every excuse in the book. Trying to motivate you to do the half, I then go out and finish the 135-mile Badwater Ultramarathon. Seeing me finish, you then realize that a 13.1-mile race is quite doable, and so you start your training and ultimately finish. It's the same with "No Impact Man." What the family did was insanely difficult--giving everything up (in Manhattan, no less)--but it shows us that reducing our carbon footprint can be done through a few simple measures in our everyday life. If you haven't already seen "No Impact Man," check it out. The trailer is below and here here's a link to his blog. Yesterday my aunt sent me an e-mail asking if I'd seen an article about over-training for ultramarathons that appeared in the Tuesday, 9/7 edition of The Wall Street Journal. The article is entitled, "Why Trainers Say, 'Slow Down'," and focuses almost entirely on ultramarathoners. "Type A personalities will increase their training load until something backfires.... In their minds, taking rest means they're not working hard enough." "The body responds beautifully to the right schedule of training stresses.... However, too much stress and not enough nutrition or recovery pushes your body toward injury and illness. You need to stay in that zone of just enough, and that takes a very high tuned and honest appraisal of yourself." Exactly! FYI, for her own races, Julie runs about 70 miles per week and incorporates plenty of recovery, good nutrition, and cross-training. She's the two-time women's winner of the Rocky Raccoon 100 and has placed among the top 5 women at the Western States 100. Julie's quote really hit me between the eyes because I am Type A! My wife is also Type A, but somehow we manage a great marriage! Maybe Noah won't end up being Type A, which would introduce a welcome new dimension to our family, but already he's showing some Type A signs. I think being Type A is in many respects a good thing, but you have to understand your Type A tendencies and exercise some self-control, or else your drive is going to grind you and those around you down. This is what Lynn and Julie are getting at in their quotes. Right now, as I'm nursing a foot that has been stricken with a nasty case of plantar fasciitis (but is improving by the day), reflecting on my training philosophy and considering the differences between training at sea level (as I did) and elevation (as I now am), I see many mistakes and faulty assumptions and am formulating a better approach to my next big race. At 37 years-old, I still have a few more years of optimum performance and don't want to flame out just when my times should be at their best. My theory is that an ultramarathon training program consisting mostly of running, along with some cross-training and active recovery, as well as core and upper-body strengthening and stretching (as well as a good diet, which I've always had), would be more effective than what I've been doing for the past 4 years: tons of miles, push-ups and crunches, and little else. I'm actually considering this product, in a slightly scaled-down fashion, as a complement to my training or at the very least a good strength builder during the winter months. I think the P90X program could be adapted for long-distance runners in a way that doesn't build too much bulk. Maybe I'll make myself a guinea pig. Instead of just hammering out 100+ miles per week for my next 100-miler, what if my training was about 80-90 miles per week (with the occasional triple-digit week), along with regular cross-training (biking, swimming, rowing, and walking/hiking), strengthening and stretching? Maybe more intensity and a few recovery weeks, too. Would I then see greater returns and arrive at the starting line better than ever? Maybe it's worth a try. Hats off to The Wall Street Journal for some great reporting and sound advice. Probably like you and most any ultrarunner, there is nothing I'd love more than to earn a living from my passion. How to do it, though? A few years ago, Christopher McDougall's Born to Run: A Hidden Tribe, Super Athletes, and the Greatest Race the World Has Never Seen hit shelves and also earned best-selling status. McDougall's book, which prominently features the Leadville Trail 100 and is, in my opinion, the best book on ultrarunning we've seen since Kirk Johnson's To the Edge and Rich Benyo's The Death Valley 300, has directly corresponded to a huge surge in interest in that fabled race and, in general, ultramarathoning. Then you have folks who coach others for a living, earning their pay through online and telephone consulting. I've done a few decent things with my legs, but I'm not a good enough runner to coach anyone. Plus, I really think you need some USATF coaching credentials, which I don't have but might one day. While I love providing advice to other runners and helping folks achieve their goals, coaching isn't what inspires me. And I don't have any dreams of opening a running store or of starting my own race-timing business. Writing is it--specifically, writing about running as I've done for three years on this blog (and will continue to do so). As a writer, I definitely feel pulled toward working on a book about my life as a runner, which I've kind of been doing for the past three years through this blog. I haven't really done anything amazing with my running, but to me that's not really important and it's not what makes people buy books. Running has transformed my life in profound ways. Eight years ago, I was 220 lbs., suffering from a bad back and on a crash course with a life of health problems. Running has allowed me to achieve much better health (I'm 53 pounds lighter and eat a much healthier diet than before), build self-confidence, form new friendships, come closer to my family, explore new parts of the country and truly test my limits. I think I've even helped inspire a few people in the process. I've been in dark moments and euphoric moments and dug deep within my soul. I've gone places--places deep within my being--that few have ever ventured. When I look at what's happened with the Karnazes and McDougall books, I think many people these days are starving for adventure and fulfillment and have found it in running long distances. Especially after 9/11 and, more recently, the downturn in our economy, a lot of worlds have been rocked as people reconsidered their priorities and what's important. They see these books about running great distances and their imagination goes wild. As you turn the pages, all of a sudden you feel connected to your own spirit, your instincts, your dreams and desires and possibilities you never thought were possible. As you read on, you see that your world doesn't have to be about a cramped cubicle, the Starbucks line, traffic jams, your IPhone, the rat race and constant irritation with the world. You no longer live for the next episode of "Desperate House Wives"; you live for your next trail run. You read about amazing people who aren't that different from you and me, and you feel pulled to this strange world of ultrarunning and are as excited as you are scared. You are truly alive for the first time in years. In my view, that is what has made the Karnazes and McDougall books best sellers, and what has brought so many new people to ultrarunning in recent years. The success of their books isn't about the stories within the pages of their best-sellers; it's about what people are searching for these days. Many have found it in ultrarunning. So as I think about what's in my future, I can't help but imagine a future in which running is central to what I do every day...not only on the roads and trails of Colorado, but also in the lives of others. If I can find it in myself to write in a way that inspires people to get out of the proverbial Starbucks line and test their limits through ultrarunning, then maybe I will have accomplished something that matters. Reaching kids is especially important to me. As a kid who was afflicted with ADHD and the endless energy (and misdirection) it brings and was forced into mainstream education when I really needed an education centered around activity, exploration and the outdoors, I feel like I have to do "something." I just have to find out what that "something" is. Is a book the first step? This is one of the many reasons why moving to Colorado was a dream come true. Here I am, a runner, in an area of the country that captures the imagination--huge rocky mountains, thin air, legendary races, legendary racers, stunningly beautiful valleys, pristine mountain streams and lakes and so much more. This is where dreams come true and where people reconnect with themselves, nature and those around them. Kirk Johnson's extraordinary Badwater 135 story, as chronicled in his fantastic book, To the Edge, has inspired many. Kirk is a New York Times reporter and was feartured in the documentary "Running on the Sun" about the 1999 Badwater. In about 1997 or 1998, Kirk's brother tragically took his own life, and ultimately Kirk, who had recently profiled ultrarunner Lisa Smith-Batchen for The Times, found himself in a strange new world as he took on Badwater with the support of his brother and sister. Through Badwater, Kirk discovered a great deal about himself and--dare I say--came to peace with his brother's death, while growing closer to his siblings. Here's a very moving clip of Kirk (starts at :49) on the verge of completing Badwater, as shown in "Running on the Sun."